May saw the fifth NYC taxi driver commit suicide in five months, an alarming trend which is gaining momentum. 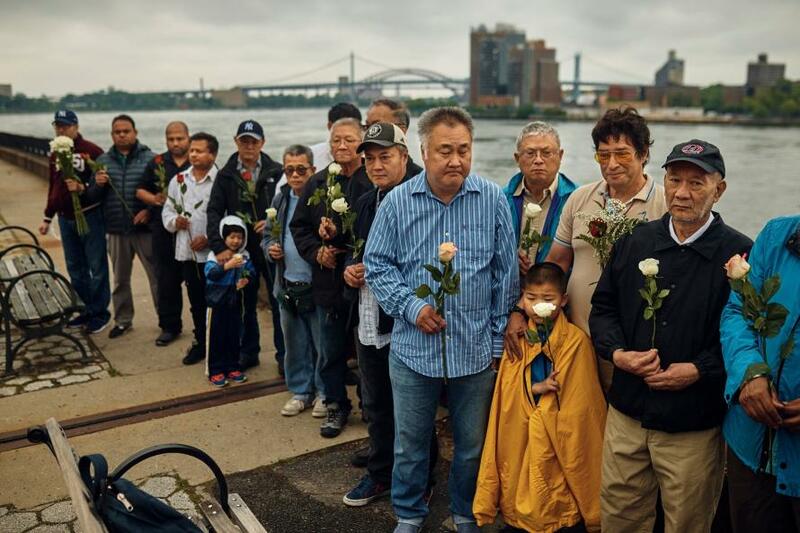 Yu Mein Chow, a 56-year-old immigrant, living in Queens, was found dead last week, floating down the East River near the Brooklyn Bridge. Seven years ago, Chow financed a $700,000 taxi medallion that allowed him to operate a cab throughout the city. Shortly after, he realized with the introduction of ridesharing apps that his ability to service the debt was unsustainable; only instead of declaring bankruptcy, he chose to end his life. For some time we have followed the unusual developments of taxi driver suicides throughout New York City, as the dark side of the ‘gig economy’ rears its ugly head, consuming these financially vulnerable folks who have become massively overleveraged through poor financial decision-making in a time of pervasive money-losing alternatives. 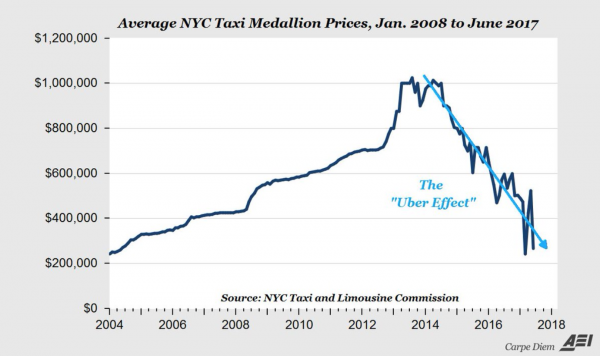 Furthermore, in a world proliferated by ridesharing apps like Uber and Lyft that do not require medallions, or any fixed investment at all, the influx of non-yellow cab drivers has crushed medallion valuations and dramatically reduced the livelihood of taxi drivers in the last few years, because as shown in the chart below, taxi medallion prices have been in free-fall for the past 6 years - since the launch of Uber cars on Manhattan streets - resulting in countless margin calls on medallion-collateralized loans. As the NYT reports, taxi drivers have demanded some form of an intervention from City Hall to protect their livelihoods, but most officials have overlooked the issue. And in the span of just five months, whether it is government inaction or simply the transition of one expiring business model with a newer, disruptive one, there has been a wave of taxi driver suicides. In most cases, drivers are ending their lives as the immense debt load of owning a medallion becomes unbearable. For those who live, some have resorted to 12- to 14-hour shifts and still have trouble staying above the poverty line. Nicanor Ochisor, a taxi driver of nearly 30 years hanged himself earlier this year after he said Uber and Lyft left him in financial ruin, according to Authorities. “He said, ‘I’m old, I’m tired, and I’m not going to make it,’ ” fellow driver Nino Hervias, 59, recalled from a conversation with Ochisor last week according to the NY Post. Another driver, Doug Schifter, killed himself with a shotgun in front of City Hall in Lower Manhattan after having written a message on Facebook blaming the industry’s demise on politicians. “I worked 100-120 consecutive hours almost every week for the past fourteen plus years, wrote Schifter. “When the industry started in 1981, I averaged 40-50 hours. I cannot survive any longer with working 120 hours! I am not a Slave and I refuse to be one,” he said. I did manage to put something away but my financial cushion never developed. deBlasio stopped a traffic study on the impact of Uber. That would have revealed the true traffic impact of so many cars and shown the need to freeze car levels. There seems to be a strong bias by the Mayor and Governor in favor of Uber. A Company that is a known liar, cheat and thief. Cuomo allowed the removal of controls and allowed unlimited cars on the road. Cuomo also placed State Troopers in NYC to patrol and issue moving violations. This never happened before in my lifetime. He has turned the city into a police state. I had almost 5 million miles experience, driven through five hurricanes and over 50 deep snow and blizzard conditions. I have driven over 100 world famous celebrities including Michael Bloomberg’s daughters and mother, the family of the man who destroyed me. What is happening to our Country where the Government now destroys the people? We are not a government of the People, by the People and for the People any more. We are turning into a Government of the People, by the Corporation for the Rich. People are becoming enslaved and destroyed by politicians and companies with the aid of the rich and the corporations they control. They are doing it by bypassing the Laws or manipulating them. America is being stolen. Your future and your families future is being stolen right now. 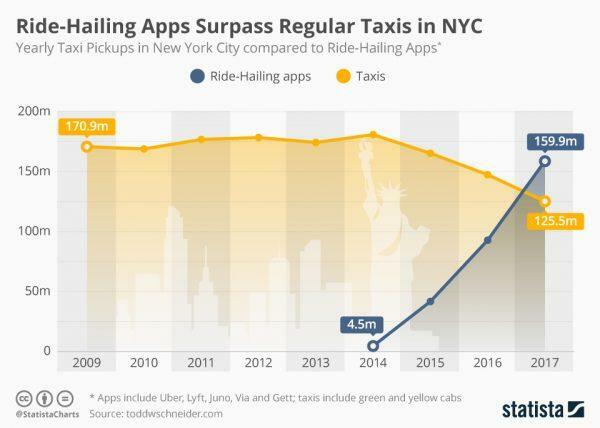 Bhairavi Desai, the executive director of the New York Taxi Workers Alliance, said in a statement: "City Hall allowed Uber and Lyft to expand unchecked, devastating the lives and livelihoods of New York City’s professional drivers." And while everyone is pointing fingers, and casting blame, nobody has come up with even a modest solution that can satisfy everyone. One thing is clear: numerous taxi drivers are suffering from the combination of large debt loads of owning a medallion, whose value is rapidly declining, forcing them into working long hours to supplement their lost income from ridesharing apps. Some take a tragic way out, and end their lives. For the rest, the future holds little hope of improvement and could lead to an acceleration of tragic suicides into the second half of the year and beyond.